You may have ordered soup in a Chinese restaurant and when it was served, it had a generous scattering of bean sprouts on top. 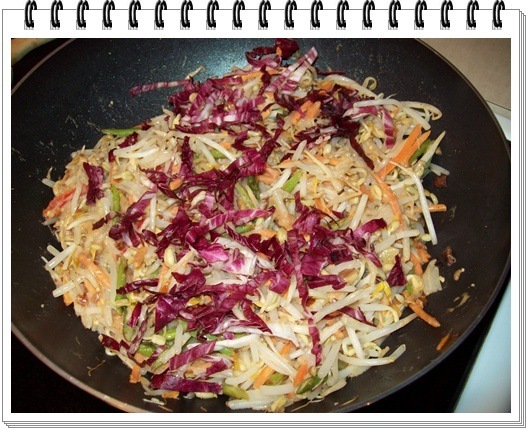 What’s special about bean sprouts is that they’re good for you and they add crunch to anything you mix them with. The only trouble is they don’t last very long – even when stored in the fridge in an air-tight plastic bag. When I buy them, I cook them within 48 hours max; otherwise, they wilt and then get watery. Most of my cooking is copied from other people’s recipes, but on the odd occasion, I like to improvise and create my own like this vegetarian recipe below. My main purpose was to come up with an attractive dish rich in colors, not necessarily one that would be a shaker and mover in the gourmet world. To make up for the 100% vegetarian content and to “wake up” this recipe a little, I looked for a recipe for tangy peanut sauce to drizzle on. 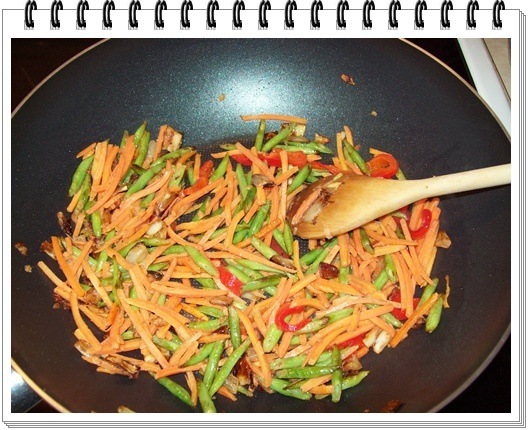 Even without the peanut sauce, however, this dish can stand on its own – the colors are enough to tease the palate. 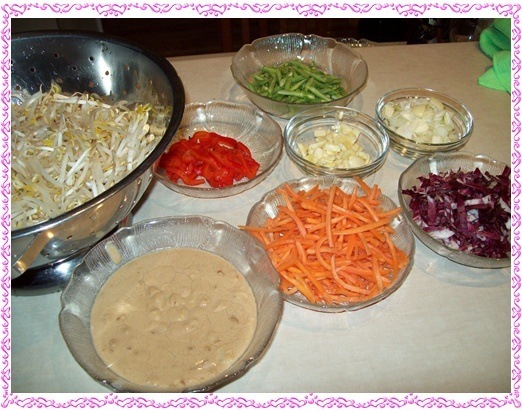 The peanut sauce is a bonus, and it does enhance the taste of the veggies. Sauté onions and garlic in oil on high for one to two minutes. 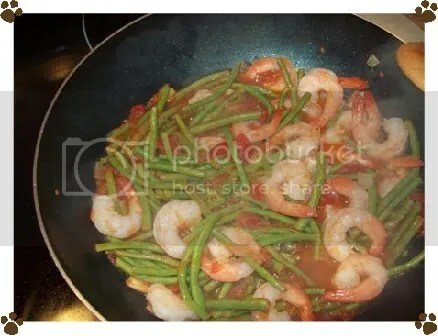 The first vegetable you add is the one that takes the longest to cook, in this case the green beans (it should take about 7-10 minutes before they become tender). Next add your carrots. Continue to sauté for 3-5 minutes on medium heat. 3. You can now add the red peppers. After 1-2 minutes, add your purple cabbage strips. Continue to sauté, but reduce heat to low. This is a good time to add your bean sprouts. Do not overcook. If you do, your dish will be too wet. Turn off heat. PEANUT SAUCE (to this recipe I added about 1/3 cup of coconut milk and a few drops of red hot chili sauce). In a non-stick pan, combine all ingredients, stirring constantly over medium heat until peanut butter has melted. You can do this in the microwave too, for about 30-40 seconds. (Note: be careful when you cook the sauce. Don’t let it become too thick because you can use any leftover the next day. It tends to thicken with time). I had some leftover canned tomatoes and shrimps and was wondering what I would do with my half a bottle of rice vinegar. I came up with a delicious meal that was gone in a flash. Something about green beans that encourages a hearty appetite. I like the green beans sold in Asian stores – the thinner ones – as opposed to the “fat” ones that most supermarkets sell. Heat oil in frying pan. Sauté onions and garlic (about 2-3 minutes). 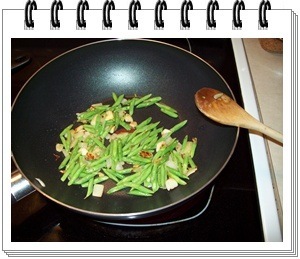 Add your green beans and continue sautéing for about 20 minutes, lowering heat. When beans are tender, pour in your tomatoes. Add your dry mustard and rice vinegar. Salt and pepper to taste, but be careful as canned tomatoes have their own salt. Serve warm over a bed of white or brown rice.